I’m hung in the best location of the entire trip. It’s amazing what a bit of local knowledge can do: Mariella has directed me to a good spot where I have a loch and mountain’s as my view, and a stream burbling away right beside me. On top of that, the hang was perfect last night (turns out more sag than I usually go for, plus less air in the mattress makes a world of difference). 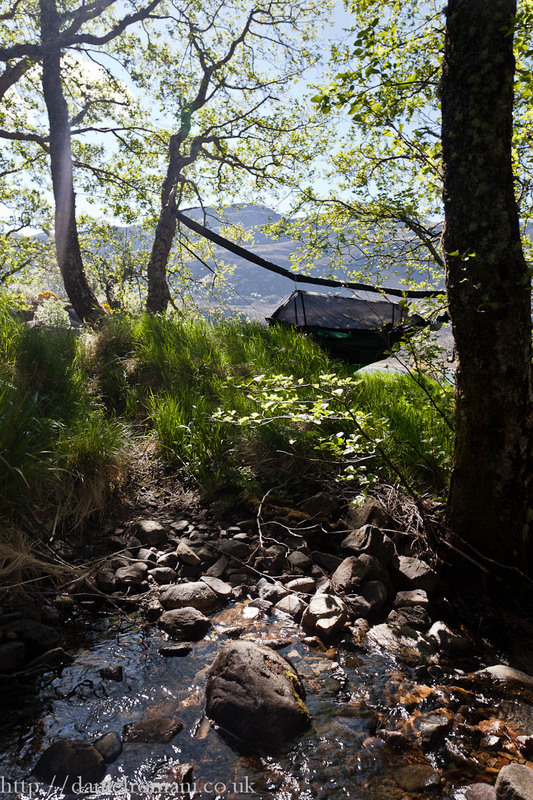 There’s a strong wind coming up off Loch Long but I’m snug in the scoop of the hammock and, although I can hear it, I can’t feel the wind. 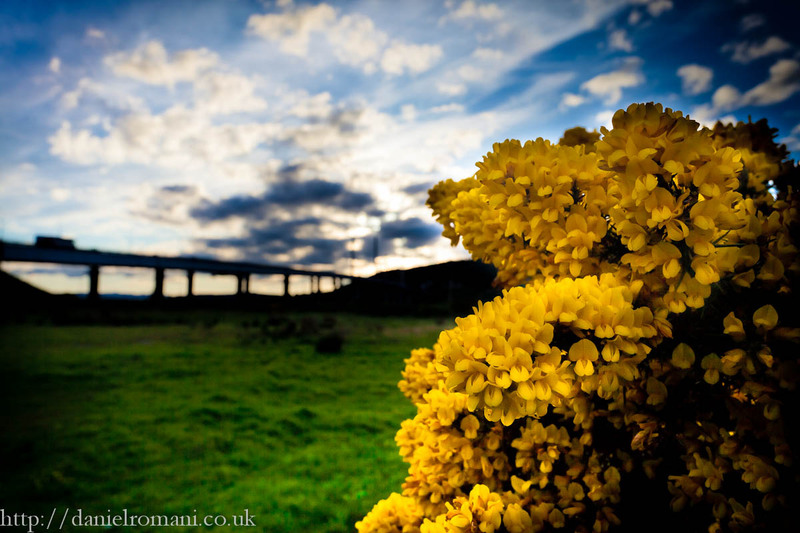 It’s worth clicking in this picture to see the full size pano! I could sleep here all day! I want to do just that – after yesterday’s walk, followed by a late night, I’m both invigorated and exhausted at the same time. Plus, getting out of the hammock means I have to get ready to leave and begin the final stretch back home. Ah, what the heck, I’ll snooze for a bit longer! I think I’ll go skip some stones. I can’t quite psyche myself up today, I’m in a foul mood. Maybe I’m just nervous about Applecross, it’s hard to say whether it’s intuition or just fear talking but, whatever the reason, I’m just not feeling lucky. In any case, I decide to keep pushing myself outside of that comfort zone! The bike is ready, so I’ll just have to be. 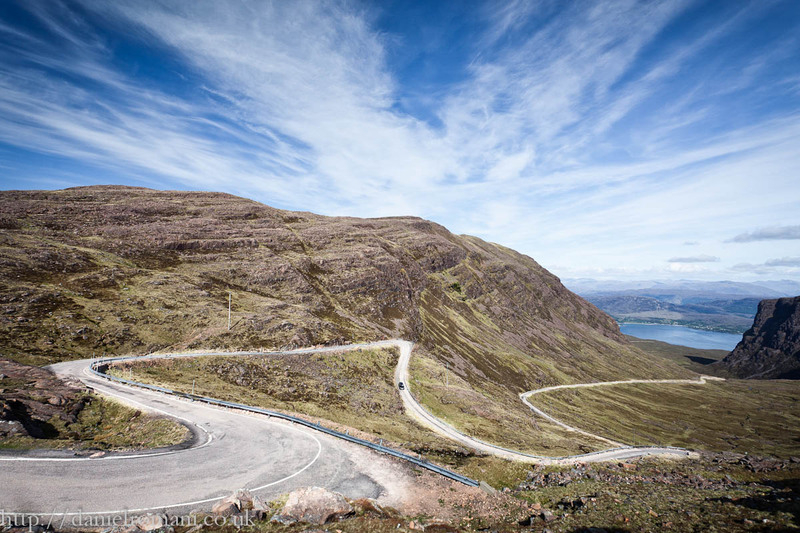 Applecross is the 5th and final Mountain Pass on my version of the Bike8 and, again, it’s a road I’ve witnessed as a car passenger. Back then I was terrified, but then I wasn’t the one in control! When I get to the turn off, the Zumo doesn’t want me to take it; I’ve added a waypoint for the Spindrift B&B (about halfway round) to make sure I don’t miss this road out, but still the Garmin would prefer me to head North, take a later turn back in towards Spindrift then U-turn rather than go over Applecross! Scaredy Cat. I remind myself, and the Garmin, that this is not the quick route to anywhere; if it wasn’t scary, there’d be no point in taking it. I think that starting from the South entry is a better way of doing it than the way Bike Magazine would have you go. Coming in this way, the brute presence of the mountain’s squatting in front and towering above you asserts itself – and besides, ascents are more fun than descents. 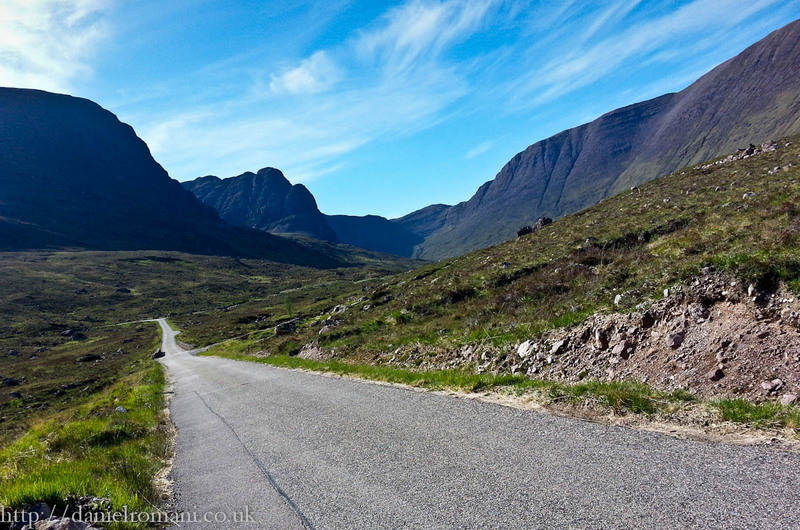 Where the Glen Coe road (A87) had me feeling like a God, this route makes me feel like a Gnat! It’s Mother Nature’s way of reminding me who’s actually in control. You mean I gotta ride over that?! The road itself is pretty quiet and lots of fun. It’s challenging but you sense that it’s challenging for everyone; unlike Duke’s Pass, where I was being overtaken by local bikers doing 80mph while I crawled along at half that speed! The ascent from the South is one of those roads that make you want to stop and photograph it after you’ve done it; the way it snakes back and forth up the cliff face means there are plenty opportunities to stop and do so, but I waited til I was at the very top and then went scrambling over the rocks like a mountain goat to get the obligatory shot. That’s the hard part over and done with. The rest of the route is enjoyable; the views are splendid and I can actually enjoy them going in this direction, rather than spend the whole route worrying about that road! Leaving Applecross I experience, for the first time on the Bike8, a true sense of remoteness. There’s just something baron and inhospitable about this next section. I imagine what it would have been like if I’d had proper Scottish weather, rather than being blessed with all this sunshine.. I doubt very much I’d have made it this far! It’s feeling pretty remote out here. 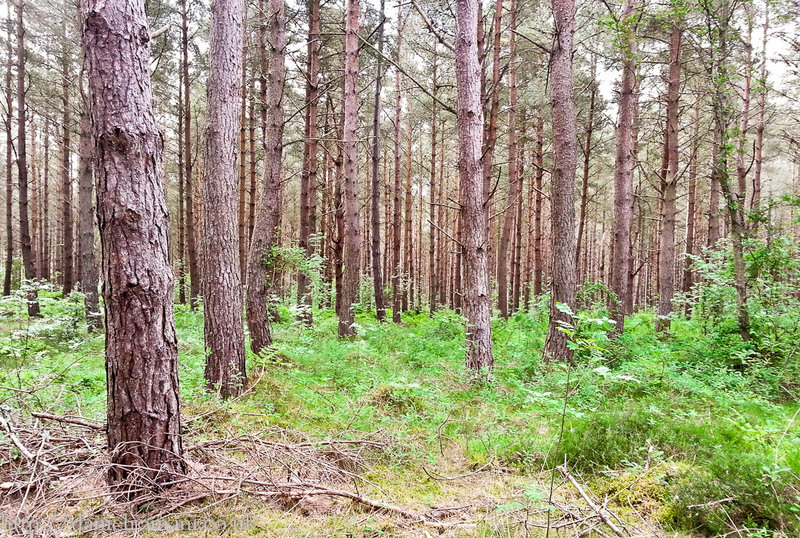 Another Pano, this terrain really calls for it (click for full size). I’m relieved then, when the Sat-Nav tells me to turn left toward Inverness rather than carrying on further Northward to Ullapool and doing a full coastal circuit. The roads through Kinlochwe are something else entirely! 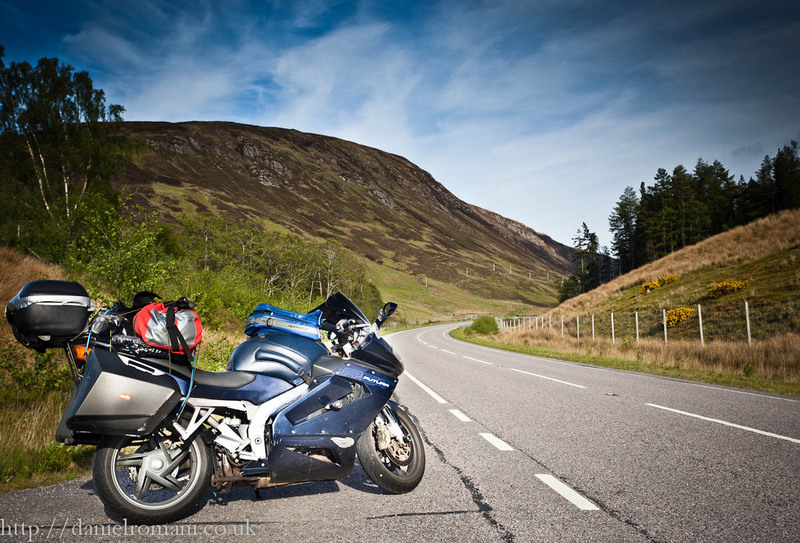 Now I see why people rave about the roads in the far north of Scotland. They’re wide, evenly surfaced carriageways with long sweeping bends and even longer straights. There’s virtually no-one here (given that it’s ‘rush hour’) and I feel like I’m in an American road trip movie. 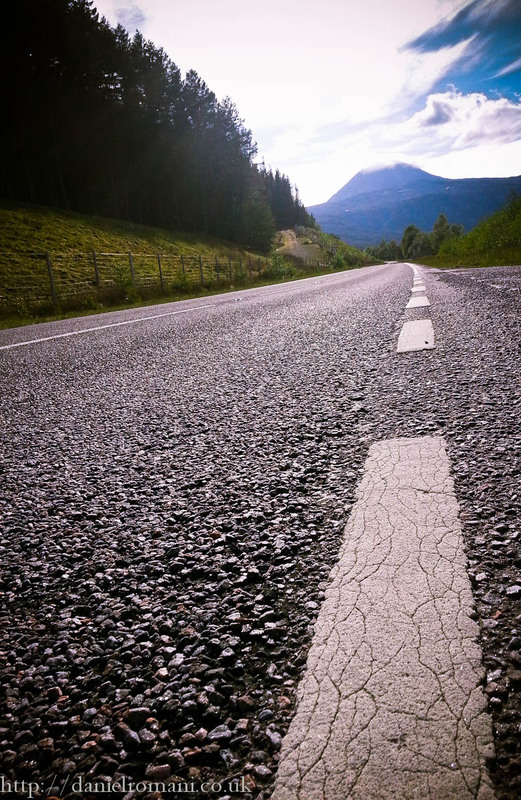 The road beckons and the Futura eagerly awaits. Wide open roads – like my own personal playground. 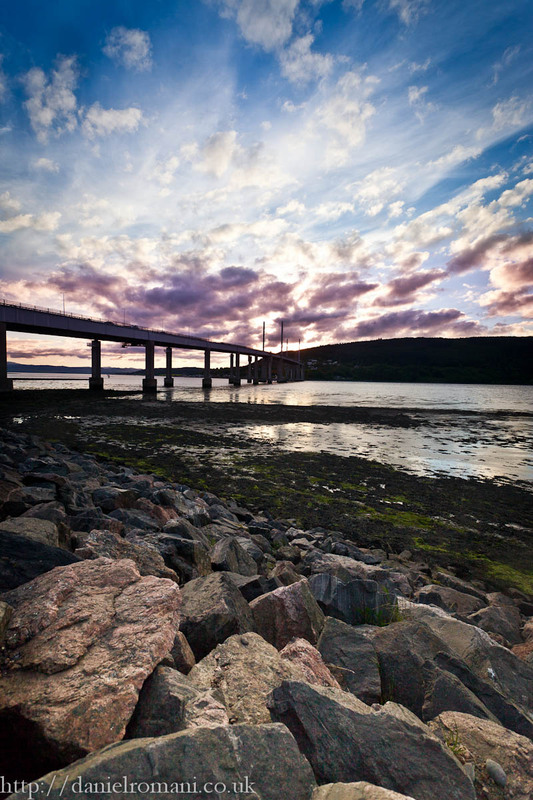 As I said, I’m in no rush to be anywhere today, I’d quite like to reach Elgin before nightfall (just because I know I can get some good sunrise shots from there) but I’m not even sure the route takes me that far East! 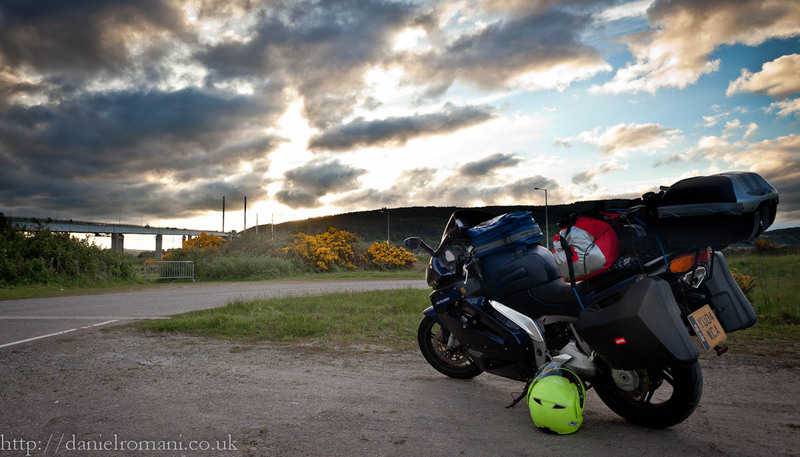 The sun is starting to set already though and I’ve only made it as far as Inverness. I can’t hang here! What are these yellow flowers? They smell amazing! Time to find somewhere to hang my hammock for the night. I do hang around though, to get some shots of the sun setting behind the bridge, before moving Eastwards with the Sun at my back. The road climbs a little and there’s a point at which it swings North and I see that, from here, the sunset looks even better, so I turn off-route looking for a good viewing place to photograph it. I don’t find one anywhere though, and it’s approaching 10pm, so instead I choose somewhere to hang my hammock. It’s not as secluded as I’d like; I anticipate being woken by dog-walkers in the morning, but it’ll have to do! Plenty of choice for where to hang! Nice write up. Next time you need to stay at Applecross and eat in the pub. It’s worth spending the pennies on! Have a look at my blog http://www.wintonmassif.co.uk for loads of camping trips up here. What was the Hammock like? Was it tricky to find a place to store your kit or did you just hang it from the tarp? Sorry it’s taken so long to reply – I have my comments on my business site sent to my phone, but not this one, so I keep forgetting to check! 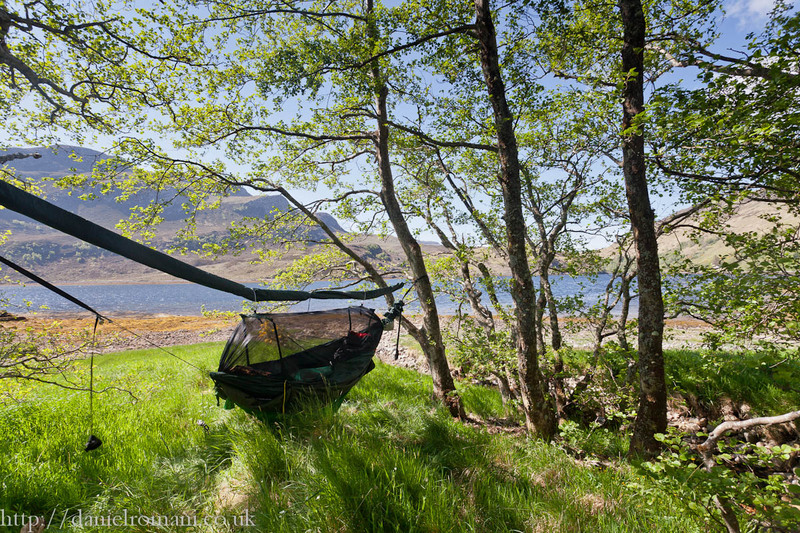 In answer to your question about storage: I’ve attached a smaller, lighter hammock underneath the main hammock body and I use this to store my gear, it means it’s always easy to reach 🙂 It also stops the hammock from swinging about too much. And as far as the hammocking experience goes; I’m now an addict! I even have one in my bedroom (not instead of a bed but only because it’s too small for anything other than dozing). 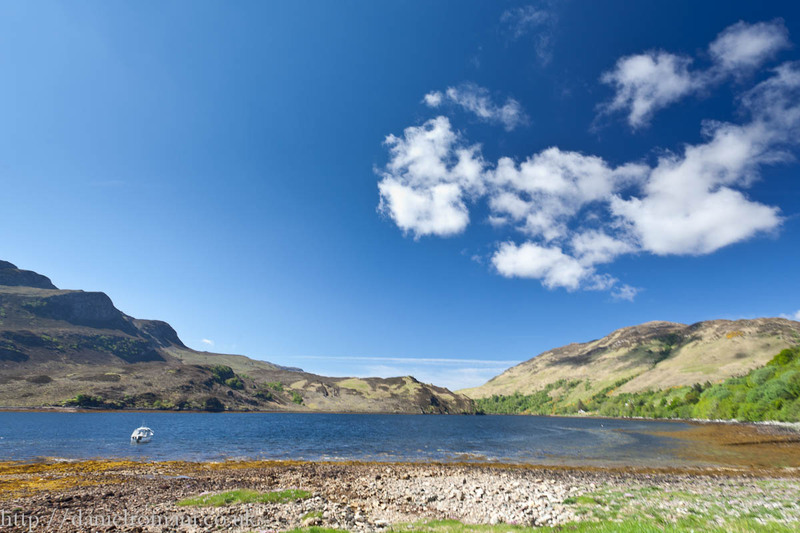 I can recommend Red Skye restaurant though (on Isle of Skye, obviously)!